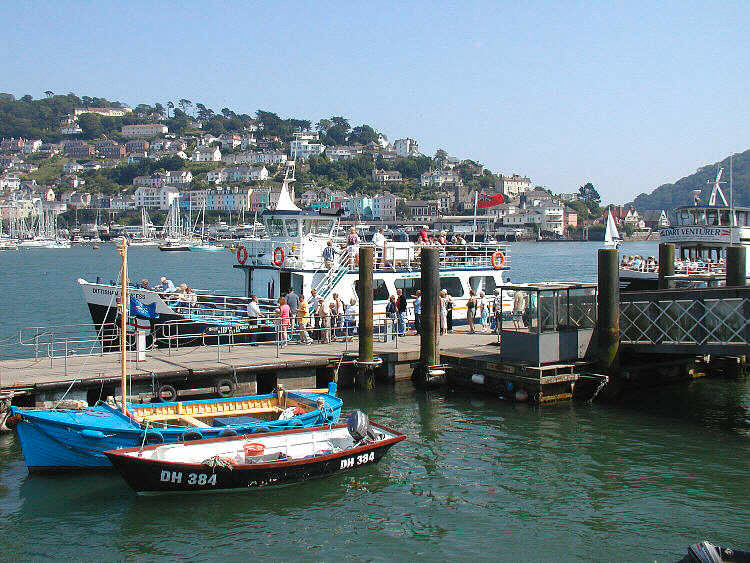 Dartmouth is our local town, the place where most of us shop, relax, play and in some cases work. Inseparable from Dartmouth is the River Dart. The town faces the river, not inwards on itself, and the river is what mainly defines the town. The narrow entrance to the river, and the steep-sided surrounding hills, provide a sheltered and deep-water anchorage that made it an important port – both mercantile and naval – from medieval times onwards. The European fleet bound for the Second the Third Crusades in the 12th century set sail from Dartmouth, and Britain’s Royal Naval College still sits above the town, looking down on the river. The town has many shops, galleries, cafes, restaurants and bars – and a weekly market held in the old market square. From KIngswear on the opposite bank of the river steam trains run up the flank of the river and over the hills to Paignton. Ferries, including a veteran paddle steamer ply between the town and various points on the river as far as Totnes. Favourite intermediate stops are at Agatha Christie’s former home Greenway House (now owned by the National Trust – www.thenationaltrust/greenway) and the riverside village of Dittisham, with its waterside inn and alfresco café/restaurant. Throughout the year there are various festivals and events.